Here is a picture of my youngest son, Sean, showing off our handiwork. 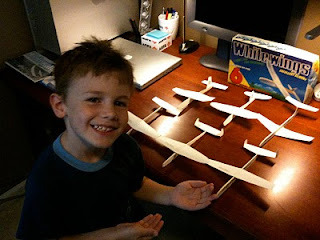 We constructed a number of White wingsairplanes. Unfortunately, between both kids, there are only two left undamaged from abuse. The others need repair, but I can not seem to find Duco Cement in Greenville, SC. Where did we get it?